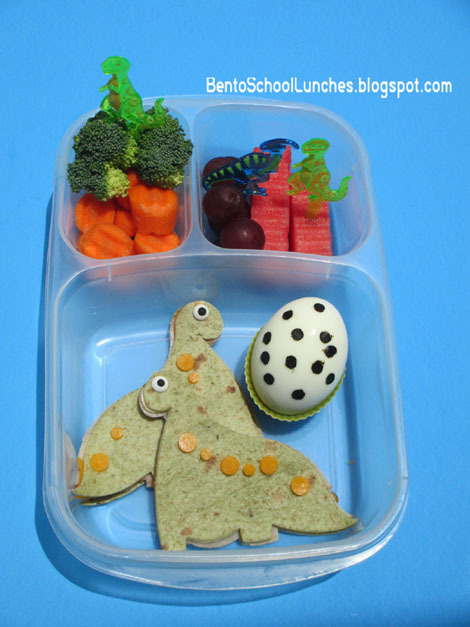 Since I have a bag of spinach tortilla on hand, I thought that a Dinosaur theme bento will be ideal. Couple of weeks ago we had the pleasure of dining and shopping at a Dino themed restaurant. In this bento: The top section contains broccoli florets, crinkle cut organic carrots, seedless red grapes and crinkle cut watermelon. Bottom section contains couple of Dinosaur shaped spinach tortilla with ham and cheese, candy eyes and colby cheese for body accent. And lastly, a Dinosaur egg! Packed in Easylunchbox. I love the theme. Very cute! I also like the idea to crinkle cut watermelon. Cute lunch Rina! Love the green tortilla! That is so cool! How fun!!! So nice pictures! And the Dino egg is a great idea!